Drill powered scrubbing kit included 4inch Soft Scrub Brush, 2inch 3inch 4inch 5inch Medium Scrub Brush,is perfect for a buyer who has a variety of cleaning applications and wants a kit that can clean almost anything. White soft brush allows you to clean Carpet, Upholstery(couches, chairs), Leather, Glass and other gentle Scrubbing. Orange medium stiffness brush for cleaning Tile, Grout, Fiberglass Showers, Siding, Linoleum, kitchen, bathroom, boats, stoves, cabinets, counters, porcelain, pool, brick, ceramic, marble, general purpose cleaning and scrubbing. Our most popular brushes are the yellow and green brushes. 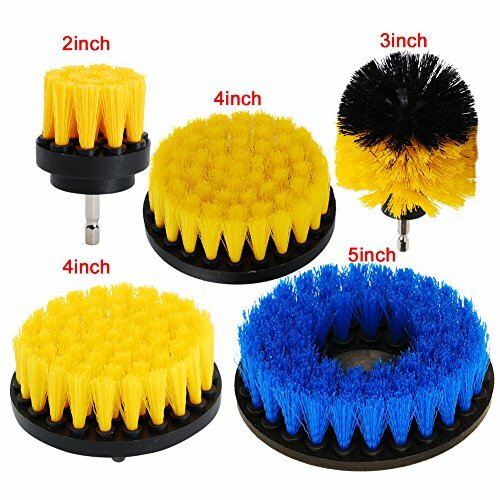 -Different sizes and shapes of brushes for gentle scrubbing, smaller diameter allows access to tight and hard to reach areas such as around bathroom fixtures and corners. -The bristles are durable enough to dislodge old stains and they will hold up better than the Soft Carpet Brush on heavy duty carpet. -This Brush is designed to brush away dirt and grime with the help of your cordless or corded drill! Brush attaches to most cordless drills. -Just mount the Brush in your drill, and you'll be cleaning and scrubbing easily with minimal effort. -This Brush is the cost-effective tool and amazing rotary brush for your cordless drill that makes cleaning and scrubbing EASY! Save your time. -This brush is made with durable PP bristles, designed for the toughest cleaning and brushing jobs. 1.VARIETY of APPLICATION - Works great for cleaning boat/marine hulls, tires, grout/tile, tubs/showers, bathroom,grout, kitchen, stoves, cabinets, counters, Pool,siding, linoleum, Carpet, Upholstery(couches, chairs) , Leather, Glass and other gentle Scrubbing. Use this drill attachment brush kit (Included 4" soft and 2" 3" 4" 5" medium bristle brushes) can variable speed drill for maximum cleaning control. 2.STRONG CLEANING QUALITY- high quality premium soft bristle brush lifts combined with the high speed rotation of the drill easily extracts spots from leather and fabric upholstery or carpet, medium bristles will not scratch, brush with the high speed rotation of the drill can be used on cleaning effectly tubs, sinks, baseboards, fiberglass shower enclosures, shower door tracks, and porcelain. 5. HIFROM focus on provide high quality products at fair price: Professional factory, Professional technical support; 3 Months warranty; if you unsatisfy with our product, you can return to our USA warehouse, no risk.